When was the last time you went out and listened to a great DJ, ate a complete meal, and had enough drinks to get tipsy, all for $25? If your answer is never, then we’re here to help you change that! 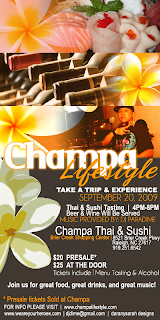 Come join us on Sunday September 20th from 4p-8p for the first edition of Champa Lifestyle, our new sushi and thai tasting party! For $25 you get unlimited sushi and thai food AND unlimited beer and sake. We’ll have reps from Singha and Ozeki on site to help you enjoy yourself! Music will be provided by DJ Paradime. Paradime is one of NC’s most respected DJs and boasts a diverse career that has even taken him on a nationwide tour. And if if $25 isn’t low enough, how does FREE sound? We will have a LIMITED guestlist. If you want a spot on the list, please send an email to info@champalifestyle.com with your name as it appears on your driver’s license. A few days before the event we will select names randomly from our list and those people will get to enjoy themselves for FREE.